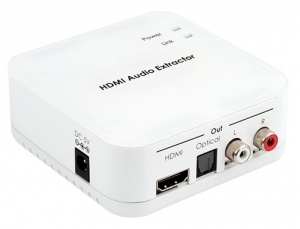 The HDMI Audio Extractor is a device that allows you to extract audio signals from your HDMI/DVI source. When connecting with a TV or display you don’t always get great audio, or in the case of a display, no audio at all, so with this Audio Extractor you can take your original HDMI audio signal and convert it to optical and L/R audio. What this means is that you can output your audio signal to external speakers or extend your audio signal, the HDMI Audio Extractor is the perfect choice. • Input source equipment and output display TV/monitor and or amplifier/active speaker with connection cables.